Bahia Principe is a hotel chain with 4 and 5 star establishments and 20 properties in total. All of them are located in the most attractive destinations in the Caribbean (Dominican Republic, Mexico and Jamaica) and Spain (Tenerife). 5 star hotels are called Gran Bahía Príncipe and 4 star hotels as Bahía Príncipe. The crème de la crème of the Gran Bahía Príncipe resorts are branded the “Don Pablo Collection”. Founded in 1995, Bahia Principe is the youngest division of Grupo Piñero, one of the leading groups in the tourism industry. The chain continues to expand with the aim of increasing its number of properties and thereby exceeding the 20,000 hotel rooms that it already boasts. ResorTime is a travel portal that offers travelers luxury resort condo rentals at discounted prices at hundreds of resorts in the US and Mexico. The company is one of the largest and most established rental reservation services in the Timeshare Industry, offering travelers discounted condo rentals around the world on a daily, weekly or monthly basis, without the hassle of timeshare tours. ResorTime.com has high standards for their luxury resort condos and does not offer nights for rental from just any random hotel or resort. All the properties have been extensively screened to meet stringent customer satisfaction requirements, so they can ensure that their members will enjoy their vacations. ResorTime is not just a travel reservation site, it is a unique travel club! Jayakarta Hotels & Resorts is a well-respected establishment classified as a 4 stars middle-up size hotel management company. They currently manage 7 hotels, 2 boutique suites and 1 residential condominium in various business and resort areas in Indonesia, with over 1,600 rooms in total. This chain is enjoying the reputation of providing efficient and high quality or services which are the primary aspects leading to good occupancy and average rate. Jayakarta Hotels & Resorts consists of hospitality industry professionals with long and enviable track records in the hotel business. The company's “client oriented” culture facilitates obtaining results that meet and exceed expectations. 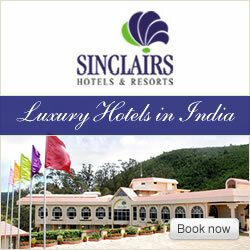 The five Sinclairs hotels and resorts offer luxury accommodation in India. From the moment a client makes a booking in one of these hotels, Sinclairs will take care of everything for the guests to enjoy every moment of their vacation. The Sinclairs hotels are designed to help you pamper yourself and for people who enjoy the nature and the pleasure of retreat. Princess Hotels & Resorts is a hotel chain specializing in vacation getaway and urban establishments in high class destinations. Founded in 1967 and ranked 8th in the Spanish market, Princess has 19 hotels and offers 9,300 rooms in total. They have Hotels in: Punta Cana (Dominican Republic), the Mayan Riviera (Mexico), Canary Islands (Spain) and Barcelona. All the hotels are integrated into the local environment and respect local features, creating at the same time a peaceful and calm atmosphere in combination with dynamic and spectacular settings. The food served in all the hotels is derived from rich traditions and a continuing culinary evolution. At Princess they are specialists in vacation tourism and the chain was one of the first to have luxurious swimming pool areas with spa facilities. They also have a wide range of events for all ages to enjoy and make for the perfect vacation spots.